with Traxxas Link WirelessModule and Installed Telemetry! It's the only way to describe it. Combine the extreme power of the TRX® 3.3 Racing Engine with the incredible Traxxas Jato® and the results will leave you speechless. Stunning, jaw-dropping acceleration and face-distorting top speed propel Jato performance into the stratosphere. It's a power packed combination for excitement we couldn't resist. Bury the throttle and 60mph flies by in a mere 4.2 seconds. Top speed is over 65mph! 2nd gear wheelies? You bet! The integrated wheelie bar is included! The Traxxas TQi paired with the Traxxas Link app is the most advanced, feature-rich, Ready-to-Race® radio system available. Now, TQi connects wirelessly to the latest Traxxas Link app for the ultimate in ease-of-use and control. 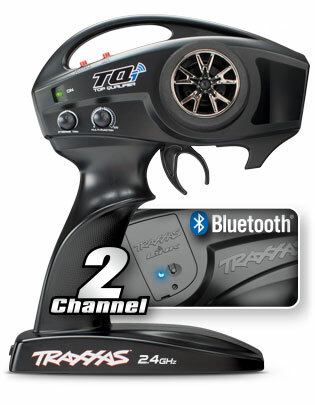 The TQi radio system can be equipped with theTraxxas Link Wireless Module to unlock exciting features such as instant Bluetooth®connectivity; access to the full range of powerful TQi tuning and telemetry tools through an intuitive high-definition graphical interface; and the ability to have a friend remotely monitor real-time telemetry while you focus on mashing the throttle. Your co-driver can even make adjustments for you, remotely, while you drive. No other radio system can do that. Just like the speed and performance Traxxas engineers into the vehicles, the power and capability of TQi and Traxxas Link expands your fun into all-new territory. Only from Traxxas, The Fastest Name in Radio Control®.Learn more about the new Traxxas TQi Radio System here. Application is available on Google Play and the App Store. Traxxas Link App. Gone are the clunky controls and blocky monochrome graphics of yesterday's radio systems. This powerful app gives you complete control over the operation and tuning of your Traxxas radio controlled model with stunning visuals and absolute precision. 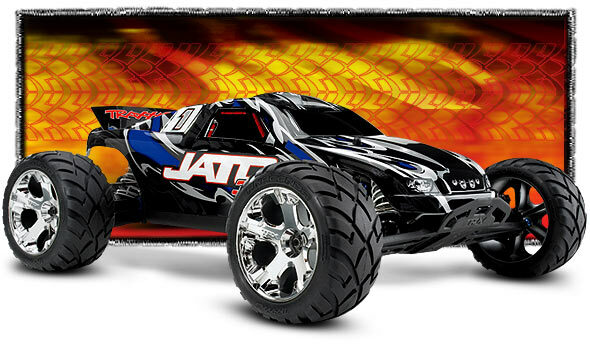 Traxxas builds the world's fastest Ready-To-Race radio-controlled models. That level of performance demands precision control. Traxxas Link gives you the tools for exacting adjustment and superior control while always keeping you informed on your model's status and speed. 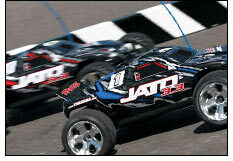 Traxxas Link collects and records real-time telemetry data as you drive. When you equip your model with optional telemetry sensors, the Traxxas Link dashboard comes to life showing you speed, battery voltage, RPM, and temperature. The application automatically detects and recognizes Traxxas Link sensors for easy setup and configuration. The dashboard is fully customizable with either dial or digital readout gauges. Up to nine gauges can be displayed at once. Set threshold warnings and log maximums, minimums, or averages. Use the recording function to document your dashboard view, with sound, so that you can keep your eyes on your driving and not miss a single apex. If you forget to record, simply touch Instant Replay anytime to capture the previous minute of fun and unexpected triumphs. The recordings can be named and saved to compare, review, and share with friends. Once you have created the perfect control settings for your model, you can save them as a profile that you can restore later, use on another model, or share with friends. If the track conditions change, simply re-tune your Drive Effects and save them as new profile. Only Traxxas Link makes pro-level transmitter tuning so fast, convenient, and easy. Jato 3.3's serious two-speed muscle power blows away typical purpose-built on-road cars, yet its suspension is versatile enough to take on the harsh realities of real-world pavement. Expansion joints, rocks, and even jumps are no problem for Jato's class-leading suspension travel. The big sticky Anaconda™ 2.8" treads and adjustable sway bars give Jato 3.3 tight, streetwise reflexes that don't require a mirror-smooth race course. When the pavement ends, Jato just keeps going. Its race-truck heritage gives it superior off-road capability. If you want to get serious at the dirt track, a simple tire change and Jato's TRX 3.3 Racing Engine belts out more muscle than most tracks can even hold. Jato is loaded with the advanced engineering DNA of the innovative Revo®. From the TRX 3.3 Racing Engine to the high-grade metric hex hardware, every component and adjustment is optimized for performance, speed, and durability. The blue-anodized aluminum tuned pipe extracts maximum horsepower from the engine. The advanced two-speed transmission is backed with the patent-pending Torque-Control™ slipper clutch. The semi-metallic brake disc; smooth, Revo®-spec GTR shocks; and precision, zero bump-steer suspension geometry, combine with a wide array of adjustment and tuning options for unparalleled driving control. Even starting the engine focuses on speed and performance. The TRX 3.3 Racing Engine has the convenience of Traxxas EZ-Start® push-button electric starting. It includes built-in diagnostics to monitor your glow plug condition and starting functions. There's no easier, safer, or faster way to start the engine. Jato 3.3 is not for everyone. This product is capable of extreme speed and acceleration! Skill level rating (5) is intended for expert drivers only. Experience with nitro-powered radio controlled models is required. The driver must exercise all caution and accept full responsibility for their own safety, and the safety of others nearby. Full-speed operation requires a large running area free of obstacles and closed-off to pedestrian and automobile traffic. Jato 3.3 is a complete package that is fully assembled and Ready-To-Race® with an installed, high-power pistol-grip radio system. The body is painted with incredible graphics and the tires are pre-glued with foam inserts. Even the decals are applied. 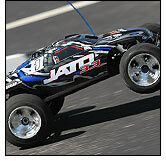 Jato 3.3 also comes with full Traxxas support. Experienced pros are with you every step of the way to answer questions and help you get the most performance from your model. Toll-free* support is available via telephone, e-mail, oronline. The TRX 3.3 Racing Engine is backed by the Lifetime Engine Replacement Plan that makes it simple and affordable to maintain peak engine power down the road. Click on the details page above to learn more about Jato 3.3's performance features and see it in action for yourself by clicking on the video page.